Twitter Direct Message: To DM or Not to DM? Private or public messaging, that is the question—especially when it comes to social customer service. While most customer service interactions on Twitter start as a public message from a consumer, mentioning the name or @mentioning the handle of a brand, public messages aren’t always the best place to share certain information or resolve an issue. So when and why is it appropriate to initiate a Twitter Direct Message with a consumer? Read on to learn the ins and outs of Twitter DMs, how your brand can use them to provide better customer care, and other creative ways to use DMs to improve your presence on this popular network. What Is a Twitter Direct Message? The public side of Twitter allows users to Tweet messages of 140 characters or fewer, and these messages show up on their profile page and on the Home timelines of their followers. Direct Messages, on the other hand, are private one-on-one or group messages that only show up to those involved. While Direct Messages used to be limited to 140 characters, just like public Tweets, Twitter expanded the character limit of Direct Messages to 10,000 in August 2015. Users can also send pictures, videos, GIFs and emojis via Direct Message. You can start a Direct Message with any user or group of users who follow you, and you are also able to reply to anyone who sends you a DM even if they do not follow your account. Many businesses on Twitter have also enabled a setting that allows them to receive DMs from anyone, even accounts they don’t follow, which is a strategic way to offer customers a private way to reach out. To receive DMs from anyone, you need to enable this functionality from the Security and Privacy settings page on Twitter. Brands can use Twitter Direct Messages in a variety of ways, from customer care to sales outreach. The most common use case is for social customer service. this allows brands to communicate in a private message, which gives users greater security if they need to share sensitive information to help resolve an issue. Additionally, the longer character limit allows both parties to explain an issue in greater depth. You can also use Direct Messages to gather feedback after a customer service interaction. The Customer Feedback survey experience from Twitter allows users to privately share their feedback after service interactions with businesses. This feature is only available through Twitter customer service solutions partners like Sprout Social. Get more information on this feature here. If you manage social for a brand, develop a protocol for when to use Direct Messages instead of public Tweets, and make sure everyone on your team is aware of guidelines and best practices. Protecting your customers’ information should always be a priority on social and in customer care. While users often reach out with a Tweet, you can prompt them to switch to Direct Message instead. On native Twitter, you can simply reply to their Tweet with a request that they send a DM. 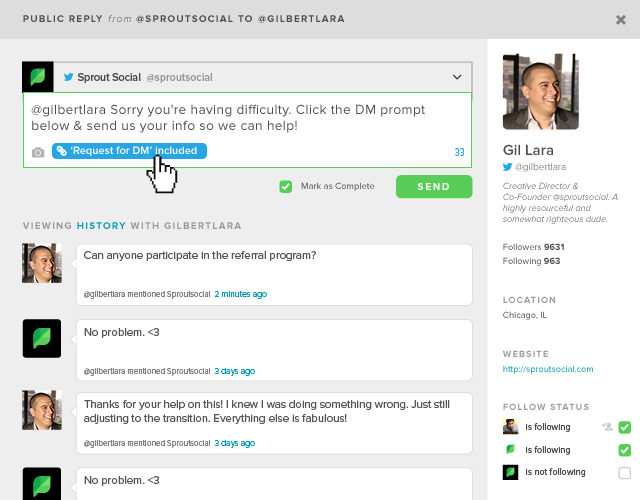 If you use a social media management tool like Sprout, it’s even easier to switch to Direct Messages. Once you have configured your settings on Twitter to allow anyone to DM your business, you will see an option in Sprout to send a DM prompt in your Twitter reply window. When responding to a Tweet, click the Add DM Link button to add a deep link that will take the customer directly to his or her Direct Message Compose screen. When switching from public Tweets to Direct Messages, we recommend sending a public reply first so it’s clear you’re addressing the conversation in a private channel. This way any other users who witnesses the interaction will know your brand is responsive and available to address any issues that arise. DMs can also be used as a channel to facilitate sales outreach, connect with influencers and potential partners, surprise and delight community members or develop relationships with members of your community. A quick look at M&M’s handle shows its social team practices social media monitoring to identify opportunities to create deeper experiences with consumers and fans. When one user shared her love for the song in an M&M’s commercial, the brand found an opportunity to share a sweet treat and sent her a message to take the conversation to Direct Message. Monitoring mentions of your brand on Twitter should be part of every business social media strategy. When you use these mentions as a talking point, you begin fostering relationships that ultimately build up your community. Start by identifying mentions from members of the media and social media influencers, and develop a strategy for personalized outreach using Direct Messages. Whether you send a simple thank you, offer to put them in touch with the best point of contact for future stories, or propose a partnership, DMs can be a great way to get the conversation started. Consumers are increasingly turning to social media to research products and services before buying. In fact, 75% of consumers say they use social media in their buying process. Paying attention to conversations about your brand as well as adjacent topics can help you identify opportunities for social selling. For example, here at Sprout Social, we often see Twitter users asking their peers to share their favorite social media management tools. When appropriate, we casually strike up a conversation to answer any specific questions they may have about Sprout and offer a link to a free 30-day trial if they’ve expressed interest. In many cases, these conversations are public-facing. However, when someone wants to schedule a demo, inquires about custom pricing often take up more than 140 characters. So we take the conversation to Direct Messages in order to get contact information and to connect people with a Product Specialist. Welcoming new followers to your community is a nice touch, whether you send a Tweet or a Direct Message. Consider using Direct Messages to start a conversation with new members of your audience. For example, you can open with a question about what brought them to your brand or offer to help. You can even provide a discount code to thank them for their interest in your product or service. Some brands opt to pursue new follower outreach with automated Direct Messages. But we encourage you to think about all the possible ramifications before adopting automatic social media messaging platforms for your business. An impersonal and clearly automated message comes across as spam. Automated DMs can quickly transform a new follower from an eager potential customer to someone who dismisses your brand and unfollows you outright. When considering whether to automate any part of your brand’s social presence, ask yourself whether you’re adding value for your audience. If the answer is no, automation probably isn’t the best fit. Be human. Treat DMs as a conversation and reflect the same brand voice and tone you use publicly—even when dealing with a frustrated or angry customer. Send timely responses. If you have a Twitter account, customers will assume they can use it to talk to your brand. If you ignore DMs or take hours—or even days—to respond, you are missing an opportunity to make your customers happier and increase brand loyalty. Provide value. Your social media strategy should include both marketing tactics and a significant plan for social customer care. Make sure you are using DMs to effectively resolve issues, help customers and leave them with a positive impression of your brand. As Twitter has expanded its offerings to help businesses practice social customer care, Direct Messages have continued to provide a way to build trust and relationships between brands and consumers. Don’t be afraid to address your customers on a more personal level. But at the same time, make sure you’re following the right DM etiquette before you start messaging away. How does your business use DMs? Leave a comment and let us know!